Our Smiles are all unique! Some are big, some are small and some are gummy! Some of us have gummier smiles than others and may want to hide it! Let’s take a look at an easy way we can help! A Gummy Smile is just as it sounds. When we smile our top lip moves up to show our teeth. Depending on our lip and teeth usually this just shows our teeth. However some with shorter teeth or long gums can show more than average. There are many different reasons that some of us may have a gummy smile. As our top lip lifts when we smile if our lip is thin then it can often disappear! This shows off our teeth more. Everyone’s facial muscles are different . If you have a very strong muscle above your top lip then you may pull your lip more – showing more of your gum. Some people’s teeth may grow improperly and remain partially covered by the gum rather than coming out fully. Long gums can be quite common and if you have smaller size lips then you may notice them more. What treatments are available to you are dependant on what is causing your gummy smile. Certain conditions such as shorter teeth will need to be seen to by a dentist. However if your gummy smile is caused by a small top lip or strong lip muscles then this can be easily fixed! 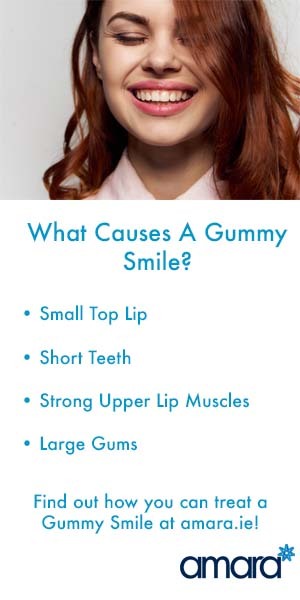 Typically if your gummy smile is caused by strong lip muscles we can help by numbing these muscles. By injecting Botox into the strong muscles that pull up the lip we can weakened these muscles. Though we can still smile of course! The muscles are weakened so our face does not pull up as strongly – leaving our lip lower over our teeth. If your top lip is thin then when you smile you may lose your lip all together! For some people when you smile your lip can curl up behind your teeth making it even thinner. By adding filler to the lips we can add volume – therefore hiding your gums when you smile. How much is Gummy Smile Treatment? If you are treating Gummy Smile with the Botox this counts as 1 area, making it €250. You can of course get your Gummy Smile treatment at the same time as your regular Botox treatment! The gummy smile will be counted as an extra area with your regular treatment. To increase the volume of your lips by adding filler we charge by amount of Filler used. Typically 1 ml of Lip Filler would be used making it €450. How Long Gummy Smile Treatment Last? Like any Botox treatment it varies on the individual,typically lasting 3 – 4 months. Filler products vary however with Juvederm Filler that we use it typically lasts 12 -18months. Am I suitable for a Gummy Smile Treatment? The best way to find out if you are suitable for any treatment is to come in for a free consultation! Contact us now to find out more! Hi I’m just enquirying if you have any available appointments on the 23rd of November for gummy smile treatment using Botox? Hi Louise, please email [email protected] or call 016761074 to get through to the booking office.